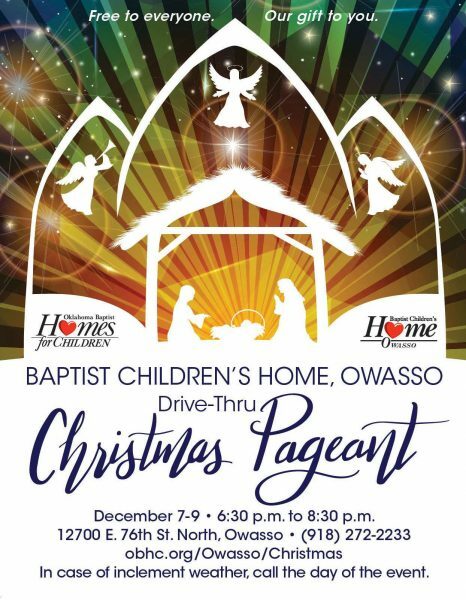 11/08/2018 -Each year in early December, the residents and staff at the Owasso campus of the Baptist Children’s Home “gear up” for their presentation of the Christmas story on the grounds of the children’s home. In November, the staff begin putting out trailer loads of background scenery, installing hundreds of curb lights, spotlights, flood lights, black lights, smoke machines and prepare numerous costumes and props for the pageant presentation. The pageant includes eight scenes with over 50 residents, staff and volunteers in period costumes, depicting various Biblical stories. Each of the scenes have two teams of actors that remain at the scene for 30 minutes at a time, representing various biblical characters. When the first team’s half hour ends, they are able to go inside to a refreshment center while the second group of actors man the scenes. Each of the centers have hot chocolate, cookies and goodies of every sort to “refuel” the teams before they return to the scenes for their second set. Biblical costumes typically hide long underwear, sweat shirts and pants, along with gloves and winter hats – as the weather requires. If you have questions about the weather, please call 918-272-2233 for a recorded message to see if that night’s pageant is cancelled. The decision will be made by 6 pm each evening.